Hitting On Girls in Bookstores: My take on the whole ALA vs. Bloggers thing (with cute animals). 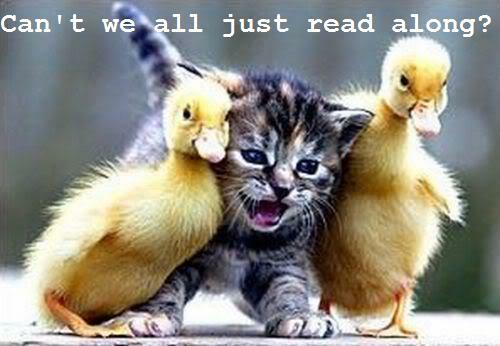 My take on the whole ALA vs. Bloggers thing (with cute animals). Pictures of cute animals with phrases on them solve all of life's problems. Huh. For me, that image conjures the opposite of what you intended: "When you're a Jet you're a Jet all the way..."
Having never seen West Side Story; I will now watch it. This will get you pretty far. The kitten-duckling formation begins around 1:55. You are my new favorite person for connecting a musical to a duck and two kittens. well, now, that's just too cute. I have no idea what's going on BUT I LOVE THAT PICTURE!